We have so flooded the Nobel Committee with emails that they've stopped accepting them. So we've started this petition, which we will have delivered to them. The Nobel Peace Prize is supposed to go to "the person who shall have done the most or the best work for fraternity between nations, for the abolition or reduction of standing armies and for the holding and promotion of peace congresses." "Manning is a soldier in the United States army who stands accused of releasing hundreds of thousands of documents to the whistleblower website WikiLeaks. The leaked documents pointed to a long history of corruption, war crimes, and imperialism by the United States government in international dealings. These revelations have fueled democratic uprising around the world, including a democratic revolution in Tunisia. According to journalists, his alleged actions helped motivate the democratic Arab Spring movements, shed light on secret corporate influence on our foreign policies, and most recently contributed to the Obama Administration agreeing to withdraw all U.S.troops from the occupation in Iraq." Few have done more. A number of previous peace laureates have done far less. Most of us signing this are U.S. citizens or residents. 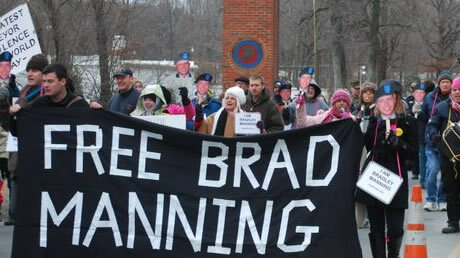 We are adding our voices in support of the nomination of Bradley Manning to receive the Nobel Prize for Peace. He has earned it.